Tagorean Futures: The Three Part Plan is the title of my book-in-progress. My research involves collecting case studies of people, projects and sites anywhere in the world, which exemplify radical relocalisation. 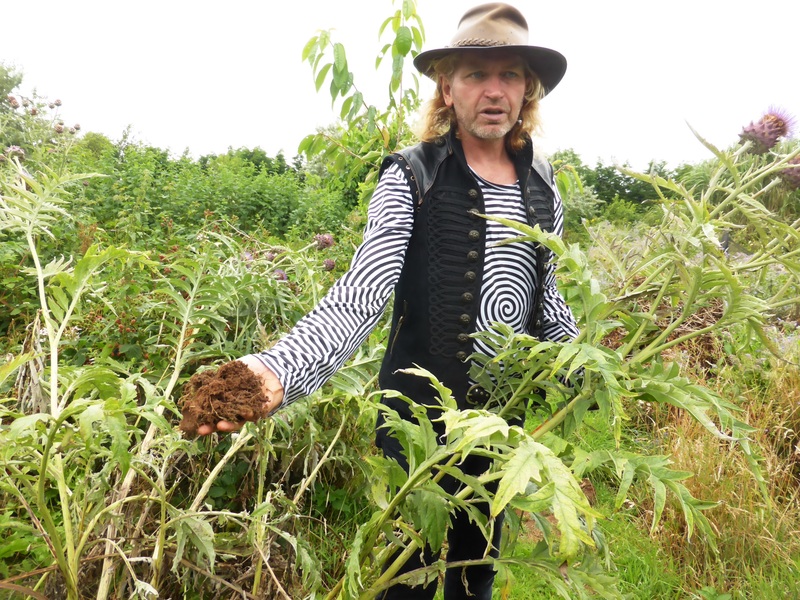 I live in Devon UK, and I am particularly interested in sites in this county where people are growing combinations of unusual edible perennials with the aim of being self-sufficient in their food, or at least in a substantial part of their diet. The plan is to visit the sites, make notes, take photos, and then write ‘stories’ to publish on the Plants For A Future website. The Plants For A Future charity was established nearly 30 years ago to support the work of Ken Fern on his experimental site in Cornwall. Ten years ago the charity was taken over by a group of new trustees in order to maintain the online plants database, which has become a vital resource for plants enthusiasts and designers of polycultures and forest gardens around the world. The PFAF office is in Devon in the South West of England, but the charity no longer owns or maintains any land. 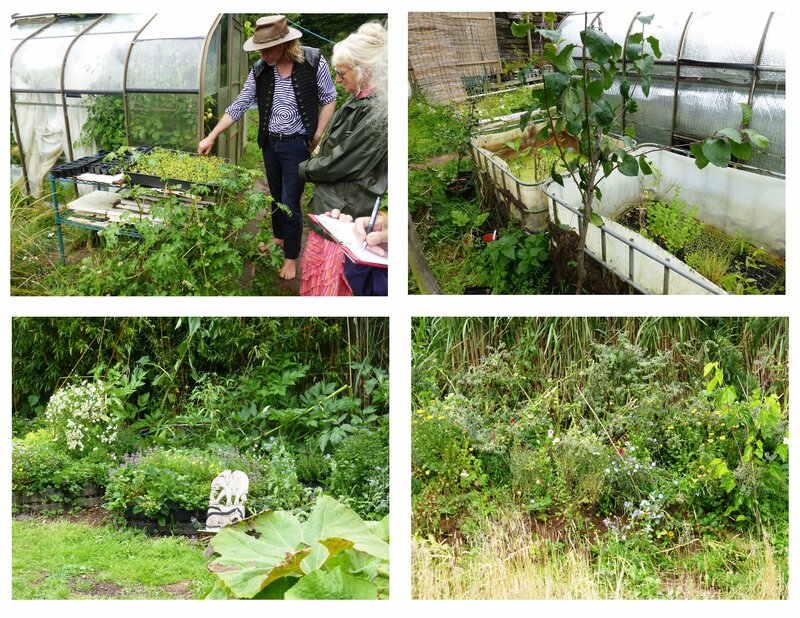 In 2017 two PFAF trustees, Wendy Stayte and Chris Marsh, began a research project involving making cooperative links with people in the South West growing unusual plants in innovative ways. They began with a visit to Incredible Vegetables near Ashburton, where they made notes and took photographs, publishing the resulting photo essay on the website at http://www.pfaf.org/user/Research.aspx?id=307. Walking into this lushly abundant garden that Sagara has created feels like stepping into a magical jungle of trees, shrubs and creeping, climbing plants, set in the midst of the relative uniformity of fields of corn of the farmland around. 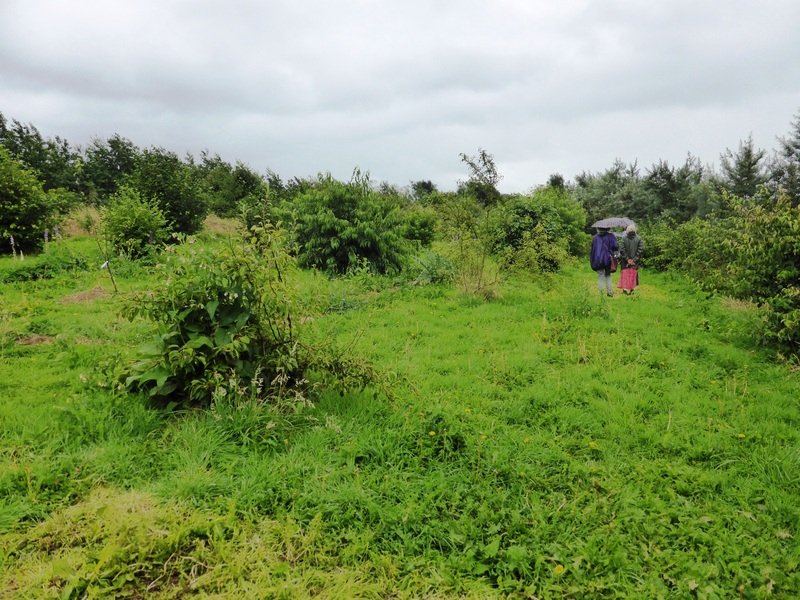 Diversity is one of the key-notes of this patch of land, where ingenious use of curving hedgerows provide not only sheltered spaces, but meant that wandering through I was constantly surprised as I tunnelled from one enclosed, often circular, growing area into another. A whole new range of plants and trees would suddenly appear, and most magical of all, after losing all my bearings, the last ‘enclosure’ was a wide open space containing a circular lake, bubbling gently here and there from solar-powered water pumps, with statues of the Buddha gazing serenely on the blue water. Though the feeling here was one of openness to sky and distant horizons, it also felt protected by being in a shallow quarry where earth had been dug out to create the pond, and earthen walls sheltered warmth-loving plants like small lemon trees. A place to swim and to relish the peace that still water brings. This was the central one of what Sagara calls outdoor rooms, which are a feature of this piece of land, some being open spaces where the lushness and diversity was in the varieties of trees and shrubs growing around the edge, and underfoot low-growing familiar native plants, like dandelions, plantain, grass and clover. The spaciousness of these ‘empty’ rooms provided restful clearings in a garden that was mainly so full of a riotous variety of edible and useful and beautiful plants, providing food for humans, insects and many other animals, vines clambering up trees, self-seeding comfrey and Babingtons leeks erupting in the midst of beds of herbs and salad plants and fruiting bushes. The overall feel is one of fruitful chaos, but comes from a judicious mix of careful forward-planning, and making the most of the ways that plants chose to propagate and spread themselves, the surprise visits of plants blown in from elsewhere, the natural balance that a garden will assume after a few years of loving and thoughtful guardianship. Nearer the shelters for human comfort and plant protection in cold and wet weather, [barn and greenhouse] were signs of Sagara’s creative and practical skills in building and designing water-heating systems, compost loos, thick earthen walls and large water bottles to conserve heat, places to cook and take shelter for the visiting groups that come here to learn from Sagara, to find some peace in this haven. 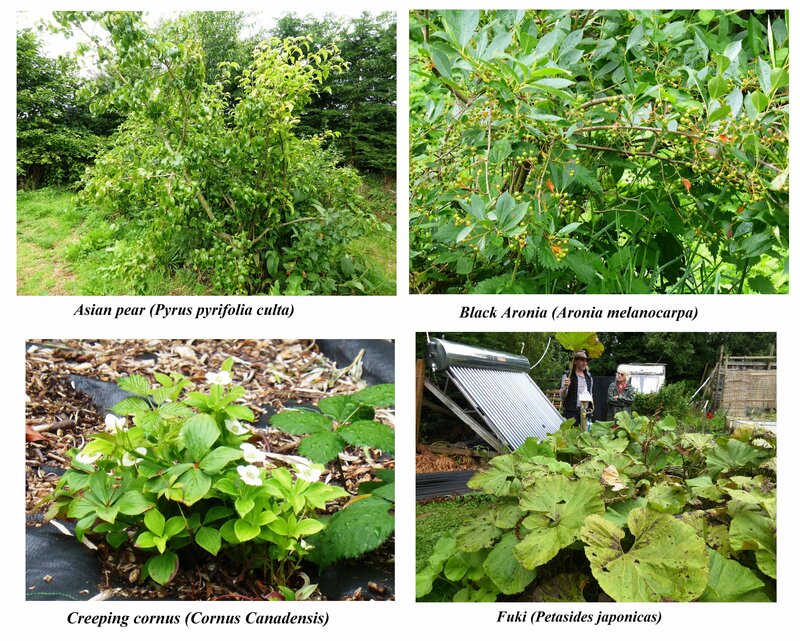 Like Ken Fern in Cornwall, Sagara began with a bare field, and was inspired by Robert Hart’s idea of a forest garden: a low maintenance food production system modelled on a natural woodland in which trees, shrubs and perennials are intermixed to create up to seven different levels. Forest gardens are designed to be largely self maintaining, to create a stable ecology, eliminating the need for herbicides or fertilizers, and the plants are sited to create naturally beneficial relationships between them. Sagara’s field is only 3 acres in extent but with its network of meandering paths through areas of established food forest, it feels much larger. At the heart of this garden is a substantial pond. Sufficient food is harvested from the site to nourish the people who come here on retreat. Visitors also find that this garden supplies their needs for psychological, aesthetic, spiritual and social nourishment. 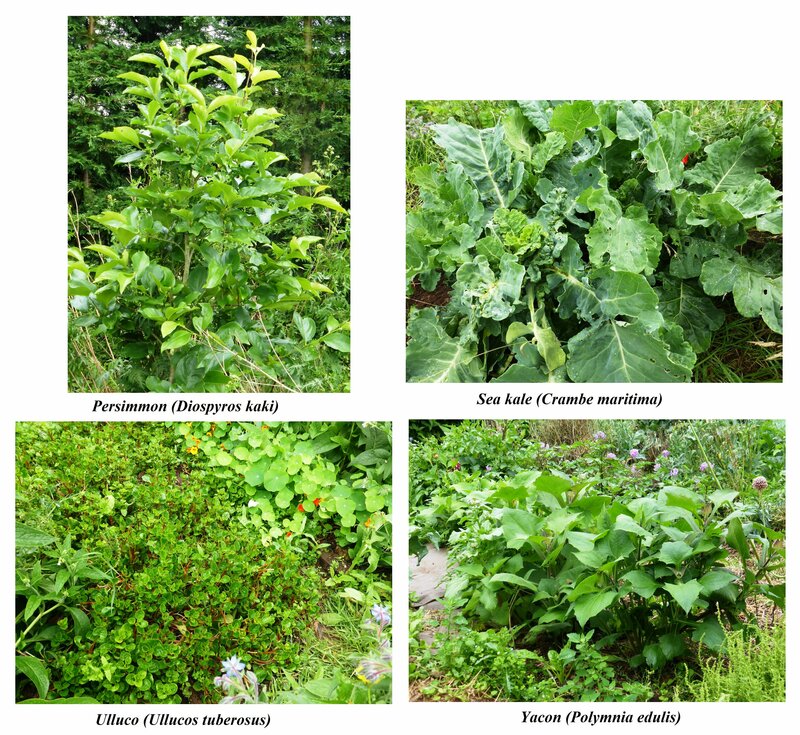 The forest garden design also has a global perspective, in that it mimics a natural woodland ecosystem, but substitutes its elements with edible and useful perennial plants. The result is a low input, high yielding food forest which has the capacity to sequester large quantities of carbon into the soil. If designs like this were replicated worldwide, as Sagara explains: ‘within 20 years 70% of the CO2 mankind has released in to the atmosphere could be sequestered into the soil in addition to producing huge quantities of food which globally is currently responsible for 30/40% of our carbon footprint’. On our visit Sagara showed us how rich the soil has become. Sagara spent two years improving the soil with green manures while he enjoyed the luxury of drawing up his design for the site over and over again. 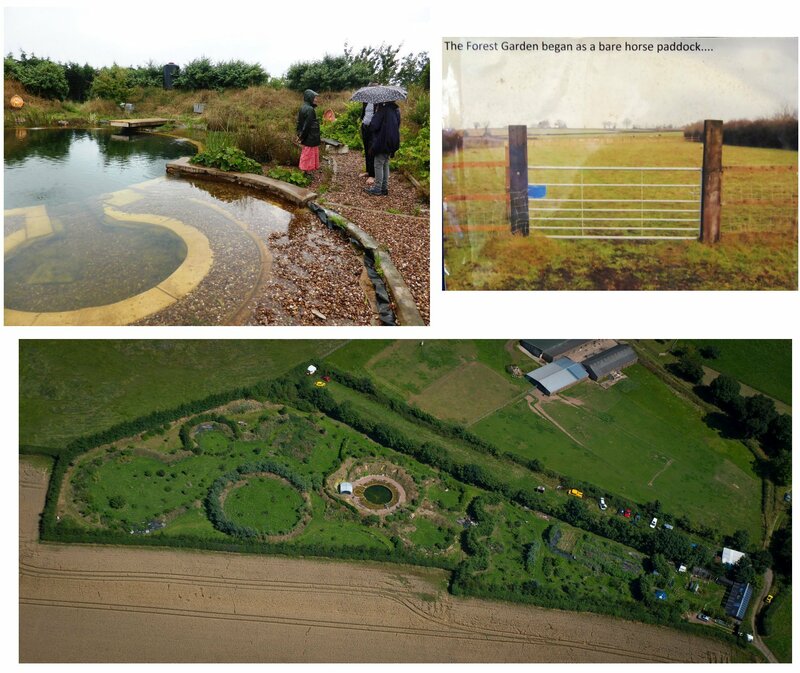 Six years ago he hired a digging machine to construct the large pond and used the excavated materials to contour the land to form a pattern of curved, sheltered outdoor rooms, each with its own microclimate. Now with rich soil and mycorrhiza established, the site is not dug or ploughed. Sagara gave us a guided tour of about half the site, before heavy rain made note-taking difficult. He told us he had concentrated initially on the upper and middle forest layers, and we saw a variety of fruit and nut trees including several mulberry trees, apples, pears, plums, damsons, olives, peaches, nectarines, walnut and a lot of soft fruit, and a grapevine growing through trees to make a climbing layer. Sagara said he was working on the ground and root layers, and we saw black plastic mulch in places with plants growing through. But parts of the site are covered by mixed perennial food plants, some of which we remembered from the visit to Incredible Vegetables. 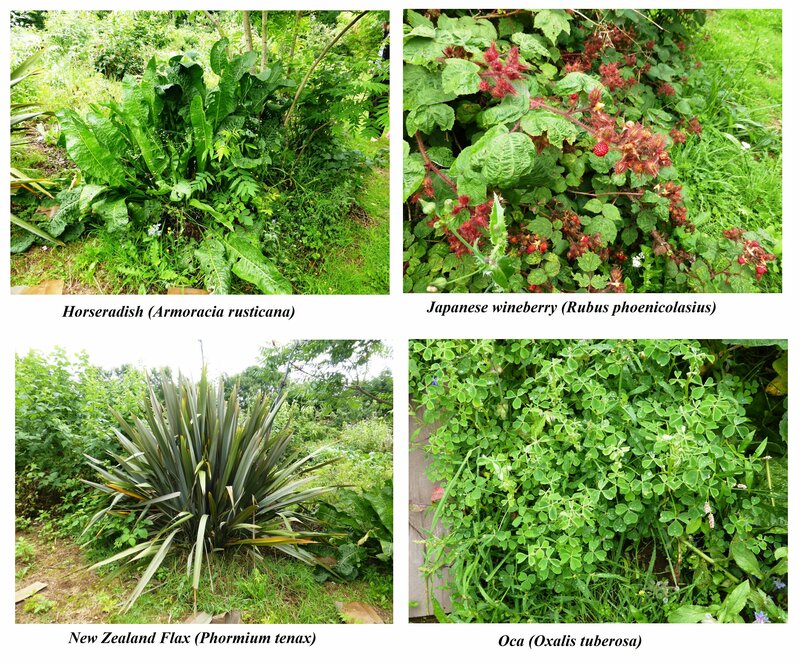 The next section has photos of some of the recognisable useful plants we saw on our visit, grouped in fours alphabetically, with links to the PFAF website. 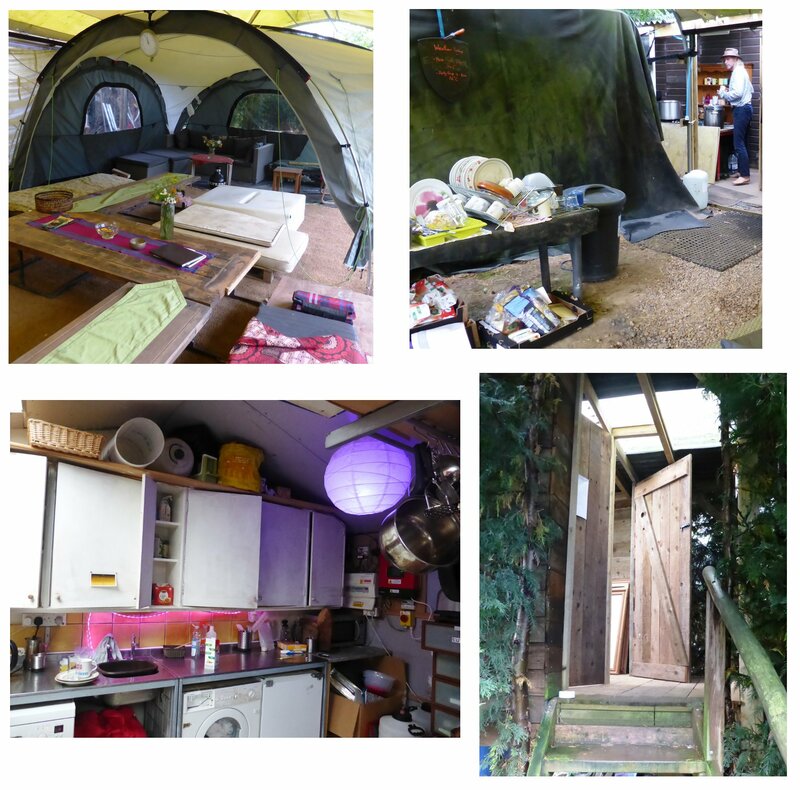 At the time of our visit, Sagara had recently hosted 17 people at a retreat, and we saw the tented seating area, cooking and washing facilities, solar water heating and the thermal mass rocket stove Sagara built on a permaculture course. There is a hot tub with well water from the site heated by a microsolar system. A power shower is underway, to be constructed from a huge orange juice container. Sagara told us that he always has conviviality in mind, the best yield from his permaculture design being people: their happiness and wellbeing. Visitors are fed from the garden and their waste goes back to the garden – hence the beautifully constructed and pleasant compost loo. One of the most surprising elements in Sagara’s design is his use of leylandii, those garden pariahs so often the cause of disputes between neighbours. But if you want screening for your outdoor loo and bathing facilities, their very tall, dense and rapid growth is a bonus. Sagara is glad of the mature leylandii boundary hedge, and he even envisages pulling some of the tops together to make a living yurt, perhaps ultimately stripping off the foliage, then weaving and daubing to form an earthship. He is growing willow too which will be woven to form a screen around the hot tub. At the start of our tour of the forest garden, we were shown the greenhouse and trays of now depleted microgreens salad, mustard etc. for the guests. Inside the greenhouse was thermal mass storage, auto-watering for tomatoes and grapes. Beside the greenhouse was a damson ‘Juno’ tree which fruits in June. Nearby were a herb bed and an edible flowers bed. Sagara would like more of the food for visitors to be harvested from the edible perennials he is planting as ground layer in his forest garden. Work is needed to introduce more plants and fill up spaces designated for food growing. But he has technical and construction work still to do, and his time and energy have to be rationed. He is thinking of integrating gardening tasks into the retreats he hosts on the site. He is also inviting people for practical courses, teaching the arts of foraging and preserving. We are very much looking forward to our next visit to this magical place – hopefully when it isn’t pouring with rain.